Categories: Dec 2018, Miniature Gaming. The Night’s Watch is ready to protect Westeros. 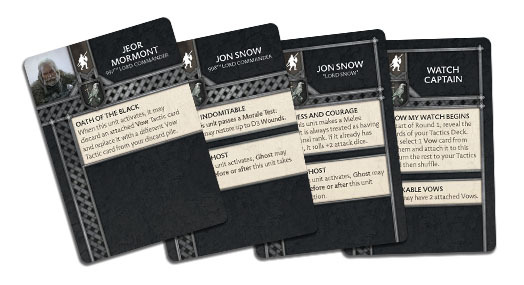 The Night’s Watch Starter Set for the A Song of Ice and Fire: Tabletop Miniatures Game gives a player everything they need to start a Night’s Watch force. It contains two units of Sworn Brothers, a unit of Veterans of the Watch, a unit of Ranger Trackers, plus many characters and unit attachments, such as Jon Snow, his Direwolf Ghost, and Jeor Mormont. It also has dice, tokens, terrain, and everything else required to start playing right out of the box.In the far North, at the very edge of civilization in Westeros, the Night’s Watch tirelessly guard The Wall against any and all incursions. Formed from the discarded men in society (the lower sons, the criminals, and the bastards), they train hard and are equipped well to face the many horrors looking to sow chaos further South. They will need that resolve to keep Westeros safe.